COMPLETELY RENOVATED FROM TOP TO BOTTOM! This sleek & stylish ranch boasts 3 bedrooms & an expanded bathroom with convenient pocket door to master. Gorgeous, high-end finishes in this open-concept floor plan include NEW vinyl plank wood floors throughout ENTIRE home, NEW sparkling white kitchen with granite, stainless appliances, subway tile backsplash & massive island with seating for 3, NEW gleaming bathroom with oversized white vanity & shower/tub combo with ceramic tile surround. NEW HVAC, NEW water heater, ALL NEW windows, doors & trim, NEW trendy glass pendant lights, energy efficient LED recessed lighting & LED ceiling fans. Hookup for stackable washer/dryer in hall. 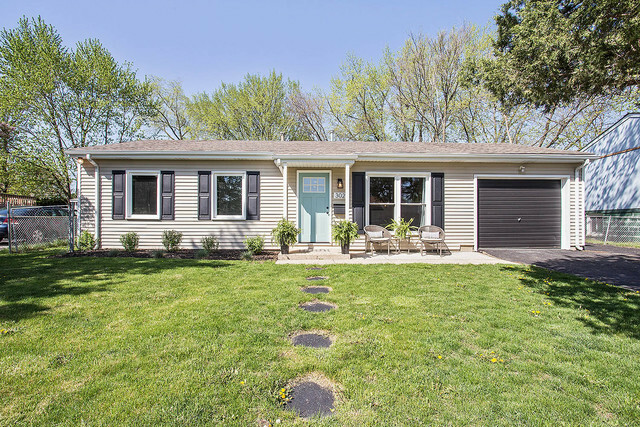 Exterior features newer roof & siding, freshly patched & sealed driveway that can fit 4+ cars, 1.5 car deep garage with NEW service garage door access to fenced backyard with concrete patio. Desirable location centered between 2 parks (each a block away) & minutes from schools, shopping, dining, METRA & expressways.